Not everyone has the star power of Ellen DeGeneres, with millions of followers to make their tweet the most retweeted of all time. So, how do you capitalize on moments like the Oscars or political debates without 40 million fans? With three simple guidelines. During our “Seven Habits of Highly Effective Organizations” webinar on March 19th, we only had time to discuss a small fraction of the questions that came in from participants. We asked Lowell Weiss, president of the Cascade Philanthropy Advisors and a Leap Ambassador, to provide answers to some of the many great questions left in the queue at the end of the webinar. What Matters Most to Folks at Nonprofits? What matters most to those of you who work at nonprofit organizations? We’re guessing probably not money, power, or fame. But perhaps a worthy cause? Making a difference in this world? Maybe a good bottle of wine at the end of a long workday? “[O]nce we can secure access to clean water and to adequate sanitation facilities for all people, irrespective of the difference in their living conditions, a huge battle against all kinds of diseases will be won." -- Dr Lee Jong-Wook, Director-General, World Health Organization. The issue of personalization arises in virtually every conversation pertaining to donor communications. Personalized communication can result in revenue increases ranging from sublime to off-the-charts. Grantseeking: What Does the Future Hold? The State of Grantseeking™ survey, reports, webinars, and articles reflect grassroots activity and trends in the field, and, because of the twice-yearly frequency, provide leading-edge information months earlier than other annual surveys. So, what does the future hold for the state of grantseeking? With annual grantmaking foundation grants totaling over $50 billion in recent years, an incredible amount of charitable investment, it feels like there should be enough funding available to support nonprofit organizations. Yet our respondents tell us that their greatest challenge to successful grantseeking (after a lack of time/staff) is increased competition for grant awards. In the Fall 2014 State of Grantseeking™ Survey we saw a trend toward greater reliance by nonprofit organizations on private foundation funders. Private foundations were the source of the largest grant award for 33% of respondents, a 15% increase from the prior year. However, we also saw a decrease in the median largest award size from private foundations. In fact, the median largest award from private foundations was $28,500, a 19% decrease from the prior year. This data tells us that private foundations are trying to meet the needs of more nonprofit organizations, but are awarding smaller grants from within a finite set of award dollars in order to do so. In spite of competition, there is funding available. Wouldn't it be nice to devote an organization's limited time and staff resources to only the grant applications that result in awards? GrantStation can provide guidance to help organizations tailor their grantseeking toward the funders most likely to respond favorably, not with magic, but with something even better—recent, trending data. For younger organizations in existence ten or fewer years, "other" funding sources were the most frequently reported source of their largest grant award. Those other sources included religious organizations, the United Way, donor-advised funds, civic organizations, and individual donors, and they appear to be more receptive to funding organizations that have not yet proven the organizational sustainability that is implied by increased organizational age. In the Fall 2014 State of Grantseeking Report™ the median largest award from "other" grant sources was $30,250. Does organizational size based on annual budget have an impact on the type of funder most likely to support an organization? When it comes to government funding, the answer is yes. Survey respondents told us that the Federal government and state governments were more frequently the source of the largest award for organizations with budgets of $1,000,000 and over. And, while larger organizations are often better positioned to administer Federal programs due to an established infrastructure, 28% of smaller organizations with annual budgets under $1,000,000 did report the Federal Government as the source of their largest award. In the Fall 2014 State of Grantseeking Report™ the median largest award from the Federal government was $319,000, and the median largest award from a state government was $147,000. Finally, let's look at how service area impacts organizational funding. Our data suggests that collaboration between rural and urban organizations will result in more frequent funding for both organizations. Unsurprisingly, funders tend to invest their charitable dollars in areas where they will have the greatest impact on the largest population. Rural organizations reported funding from any source at a much lower rate than did organizations in urban areas. However, organizations from a combination of service areas reported funding from any source at a higher rate than did organizations in any individual service area. Corporate foundations were the most frequently reported source of the largest award for organizations serving a combination of population-based areas. In the Fall 2014 State of Grantseeking Report™ the median largest award from corporate foundations was $12,000. The future of successful grantseeking is dependent upon the use of trending, recent data to guide organizational time and staff resource allocation. Are you interested in The Fall 2014 State of Grantseeking™ Report(s)? Click here to download your free copies. Would you like to participate in The Spring 2015 State of Grantseeking™ Survey? Click here to do so. Do you need funding for your 2015/16 grants strategy? Full Membership with GrantStation, which can help you take on that task, is on sale through March 31, 2015 for $149, a 78% savings. You will get access to thousands of grantmaker profiles, carefully researched and organized to help you find the right grantmakers quickly, as well as guides, tutorials, and articles to enhance your grant writing and grant strategy development. The preceding is a guest post by Cynthia Adams is CEO of GrantStation, a premiere online funding resource for organizations seeking grants throughout the world. Providing access to a comprehensive online database of grantmakers, GrantStation helps nonprofit organizations, educational institutions, and government agencies make smarter, better-informed grantseeking decisions. GrantStation is dedicated to creating a civil society by assisting the nonprofit sector in its quest to build healthy and effective communities. It's Easier for a Nonprofit to Save Money than It Is to Raise It! Making ends meet financially is an everyday challenge for nonprofits. Sometimes the greater challenge is finding ways to effectively lower costs without harming the organization's mission or programs. When it comes to targeting donors, it’s tempting to lock on to the deepest pockets. But a well-connected donor is just as valuable as a wealthy one, perhaps even more so. Donors rich in relationship capital can provide warm introductions to prospects, help recruit board members and spread your mission's message farther. I’m counting down the days to AFP ICON in Baltimore. It helps that they have a counter on their website. My colleague Kelley Stewart calls me a “conference junkie” and she’s right. I’m thrilled to get spend 3 days getting inspired by the brilliant thought leaders in our space. Jon Duschinsky and Tony Elischer’s jaw dropping multimedia sensation “The Philanthropy Kaleidoscope” at last year’s AFP was unforgettable. It raised my expectations for this year’s event which were quickly met with the star-studded keynote line up of Seth Godin, Whoopi Goldberg and Isabel Allende. Did you realize that your nonprofit’s IRS Form 990 is available to the general public? This is a big surprise for many nonprofit board members. Armed with this knowledge, a nonprofit misses a terrific opportunity to tell their story as fully as possible if they are not thinking strategically about how information is presented in this important document. For advice on what you can be doing to take advantage of this communications opportunity, as well as your IRS Form 990 generally, we turned to regular BoardAssist guest blogger and finance pro Paul Konigstein. As usual, Paul had all the answers! We know (intellectually) not to rely on magical solutions to drive our work. In practice, however, we sometimes fall into the trap of unwitting, magical assumptions. The reality is that underlying any amazing feat we might accomplish, you can bet on solid infrastructure, process and groundwork to account for it. Andy Isaacson, Forward Deployed Engineer at Palantir Technologies, takes us there – to the heart of responsibly making data usable …and useful for people. In all areas of life, making a good first impression matters. With the written word your headline is your first impression, and yes, it’s important to get it right. According to Copyblogger, 8 out of 10 people read headlines while 2 out of 10 people read the rest! A good caption will determine if your content will even get read. If you are spending time and resources (dare I say scant!) on creating content, you’ll want to make sure your headlines are captivating– whether it is a blog, newsletter subject line or more. In May, the Association of Black Foundation Executives (ABFE), in partnership with the Black Philanthropic Network, released the report The Exit Interview: Perceptions on Why Black Professionals Leave Grantmaking Institutions (21 pages, PDF). The report highlights the need for leadership pipelines, development programs, and effective retention strategies targeting African-American professionals in philanthropy and was prompted by the sense here at ABFE that too many African Americans were leaving the field. Indeed, data from the Council on Foundations—though not provided in a way that enabled us to analyze trends over time—seems to support our assumption. Are you using the new marketing and communications tools to support your fundraising? There's now an amazing array of techniques, formats, and strategies out there for us. We have more ways than ever to tell our story, connect with our donors, keep them engaged with our cause, and ask for money! Not only that, but we have hard data about what types of communications our donors respond to. We know what makes a potential donor open an envelope or not. What makes her read an e-mail newsletter, or not. Or want to give again, or not. What donors react to on Web pages. How to turn a newsletter from one that makes $1,400 into one that makes $42,000. What types of images and pictures work best. How to design and lay out a direct mail appeal for max impact. How to shape a call to action. How to start off a direct mail appeal letter. What to say on our website donation page, and what not to say. How to frame an appeal for maximum impact on a donor. We know that "real words" are more engaging than "jargon." Why say "impact our programs" when you can say "help children learn to read?" What do all these strategies and tactics have in common? These strategies merge the "fundraising" function and the "marketing/communications" function. Every day, fundraisers worry about which message to choose; how to shape the message, what words to use, how many words to use, which words and phrases to avoid. All of this could be included in a communications function called "copywriting." So, my friend, if you want to be successful as a fundraiser, you need to also have a working knowledge of messaging, copywriting, good design, and layout. You might even need a smattering knowledge of photography and videography. You could say that these skills fall into the communications and marketing arena. So if you want to be successful at fundraising, you gotta master some marketing skills. There's Plenty of BAD Marketing! Last week when I asserted that marketing and branding can kill fundraising, some of my smart nonprofit communications friends took issue. Let me make myself clear: BAD marketing and RIGID branding can subvert fundraising. What do bad marketing and rigid branding look like? Use jargon like "programs," "services," and "underserved"
Are completely missing the all-important "Call to Action"
Let's not waste our time and energy with bad marketing. If you're fortunate enough to have a marketing and/or communications staff with skilled professionals, their expertise can often help you. One nonprofit marketing professional I know says that so often, fundraisers "ruin" letters and other copy by inserting jargon, adding "flowery," unnecessary words, or making changes upon changes. Don't be one of those folks, OK? But all fundraisers need to learn these skills! Follow the smartest nonprofit communications people out there. There are plenty of experts out there who have mastered fund marketing. You should follow them all AND study their stuff. Take their classes too! Take the time to learn how to shape and deliver a message well. Ask if your marketing and communications colleagues follow any of the experts listed above. That's a great way to open a line of communication. See if you can focus your organization's full resources and skill sets to create the most toward powerful coordinated message around WHY our organization's work is important. I'll guarantee that you'll raise a lot more money. 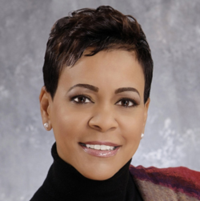 The preceding is a guest post by Gail Perry, an international fundraising consultant, coach, speaker, blogger, and thought leader. You can find her at her popular Fired-Up Fundraising blog. Her Fired-Up Fundraising approach, developed over the past 25 years as a nonprofit philanthropy expert, has helped organizations raise hundreds of millions in gifts and support. Her book, Fired-Up Fundraising: Turn Board Passion into Action, has been called the "gold standard guide" to building successful fundraising boards. "High-performance organization" is a moniker that most any company, government agency, or nonprofit would love to earn. And yet who can say what "high performance" really means for nonprofits? More important, how do executives, boards, and funders get there from here?! The Leap Ambassadors Community, a network of dozens of leading nonprofit leaders we've helped to convene, has invested a year developing clear, actionable answers to both questions. 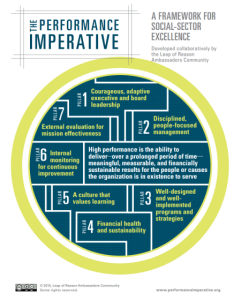 You can find them in the community's new release "The Performance Imperative: A framework for social-sector excellence" (PI). We're not aware of any other effort devoted to this mission-critical topic that has engaged as co-creators so many top nonprofit executives, funders, and thought leaders. Perhaps even more importantly, the PI goes beyond the typical focus on helping nonprofit leaders do things right. When leaders do things right, they can achieve strong operational performance but not necessarily meaningful results for beneficiaries. To achieve the results embodied in their mission statements, leaders must go the extra mile, through diligent internal monitoring and external evaluation, to ensure they're also doing the right things. We know the PI will come under fire from those who have a visceral aversion to anything that speaks of "outcomes." But the Leap Ambassadors feel strongly that the definition of "high performance" must reach higher than operational performance. It must set an organization on a journey toward real impact. Here, in a nutshell, is the community's definition of "high performance": the ability to deliver—over a prolonged period of time—meaningful, measurable, and financially sustainable results for the people or causes the organization is in existence to serve. External evaluation for mission effectiveness. The full document, which we encourage you to download and share, fleshes out each one of these seven disciplines with concrete details that the Leap Ambassadors discussed, debated, and methodically vetted. (Some sections required us to work through more than 50 drafts.) We hope organizations and their stakeholders will use the details to guide their journey toward high performance. In this era of rising needs, expectations, and demands, high performance matters more than ever. The social and public sectors are starting to steer resources toward efforts that are based primarily on rigor and evidence rather than good intentions and wishful thinking. They are increasingly favoring efforts that are based on a sound analysis of the problem, grounded assumptions about how an organization's activities can lead to the desired change, and leadership that embraces continuous improvement. This formula is at the core of the PI. The launch of the PI marks the beginning of an ongoing campaign to inspire great organizations for greater societal impact. As part of this campaign, on March 19, GuideStar will be hosting "The Seven Habits of Highly Effective Organizations," a free webinar featuring Leap Ambassadors Cynthia Figueroa, Jacob Harold, and Fay Twersky. These leaders will share why they invested their time in developing the PI, how they and other ambassadors will be putting the PI to use, and why high performance is essential for solving—rather than just salving—the "wicked problems" in our world. Let's face it: High performance is not a lightning-fast meme. It's a slow, complex idea that is going to require painstaking, methodical work to advance. What will that work entail? Atul Gawande, the Harvard surgeon and author, offered a compelling answer in his influential New Yorker article "Slow Ideas". To foster "a culture where X is what people do, day in and day out, even when no one is watching," the only approach that works is "people talking to people." Yes, we should use modern tools like this e-newsletter, webinars, and social media to get the ball rolling. But to shift the mindset of our sector and society, we're going to need a lot of honest, person-to-person conversations between leaders who care deeply about the people and causes they serve. Leaders who've made great strides toward high performance can reach out to peers who are just starting out on that journey. Board members can engage their organizations' executives in conversations about what it will take to live up to their responsibility to serve their beneficiaries in the most effective way. Courageous funders can invite one-on-one conversations with grantees about how they can better support their pursuit of high performance. We encourage you to read the PI and then spark these conversations in whatever way is right for you and your organization. Mario Morino is chairman of the Morino Institute, co-founder and founding chair of Venture Philanthropy Partners, author of the lead essay in Leap of Reason, and a member of the Leap Ambassadors Community. Lowell Weiss is president of Cascade Philanthropy Advisors and a member of the Leap Ambassadors Community. Engaging donors after they give allows you to tap into their skills and relationships and increases their commitment to your organization. By developing an "involvement menu," you can provide more opportunities for board members and other volunteers—especially those who don't want to ask for money—to participate in fundraising. Lawyer | Nonprofit Connect brings lawyers and nonprofit organizations together. It’s an easy way for the two groups to join forces and make the world a better place.